Betty and I just got back from the 27th Annual Cowboy Poetry Gathering in Elko, Nevada not too long ago. As always, the event was a moving, powerful experience that I learned long ago to not try and describe to people. The only way you will know the power of the event and your reactions to it is to make a leap of faith and go. Most years when we travel to Elko, we try to go through the country with the least amount of traffic and the best scenery. If the road conditions and the weather permit, we travel the truest route, south from Mountain Home, Idaho, which is not in the mountains, to Duck Valley, where a Shoshone and Paiute tribal community resides and then through Mountain City, Nevada, the Owyhee River Canyon, Wild Horse Crossing, Wild Horse Reservoir and then down the long, wide valley bordered on each side by north-south running mountain ranges, that, depending on the weather, might be draped in white, or partially snow-covered with their naked aspen ghosting the cold spots. Finally we drop into the Humboldt River valley and the town of Elko. And even if the weather and the road conditions aren’t optimal we take a different kind of leap of faith and travel the byways regardless of snow pack and ice. I could talk about the excellent Basque cuisine we eat, and the wild “Cowboy Halloween” characters we meet, about the music old and new, and the poetry old and new, but I’m not going to. I am going to talk about the Honda CRV rides we take. While everyone else is jammed into tight auditorium seats listening to Don Edwards or Wylie and the Wild West sing cowboy songs, or Paul Zarzyski and Vess Quinlan and Henry Real Bird read and recite poems, we often climb into the Honda and venture out on one of the roadways out of town. Hinterland is just as close as the last subdivision in this part of Nevada; very little transition country exists. Up north you can find the Independence Mountains, the old mining town of Tuscarora, and the famous Spanish ranch, which all the locals and the cowpokes-in-the-know call “The Span.” To the southeast lies the Ruby Valley, a long wide expanse of snow when we’ve been down there, with a surprising population of bald eagles sitting in the naked willows and cottonwood trees along the banks of Franklin Creek—and that’s pronounced, “crik” in this part of the world. At the foot of the valley lies the Ruby Valley National Wlldlife Refuge where we sat one evening several seasons back and watched coyotes hunt trumpeter swans on the channels carved in the swampy, red-willow-infested breaks catching the late light of the gloaming. Last year we went down there again with a carload of friends, hitting the trail just before sun-up. 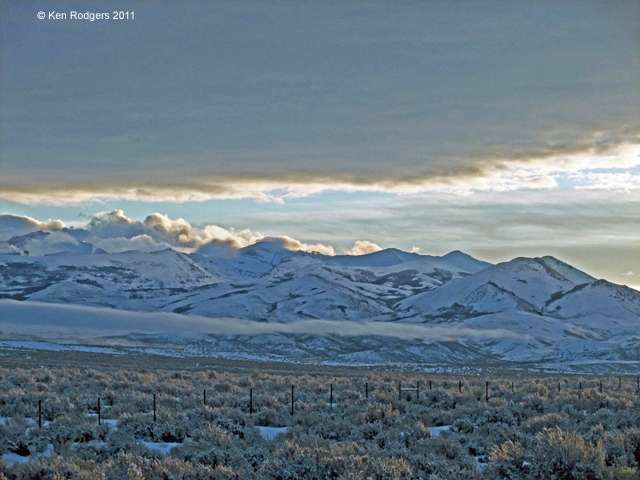 The light trapped in the ground fog and on the tips of the frosty sage made for great pictures, and the sun on the peaks when the lower ground was still dark created a stark idea of what the difference between life and death might be—or good and evil—in a metaphorical way. 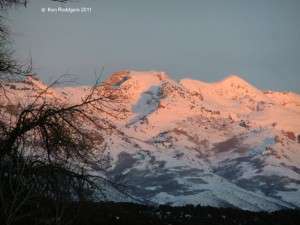 The A M light on the east side of the craggy and majestic Ruby Mountains glared back at us and one would think the glare might be too stark, but instead it was like somebody slugged you in the solar plexus with its immensity. This year, Betty and I dared ourselves again and went down the west side of the Rubies for an evening run to see if we could find out if the Rubies really were like rubies. The quality of evening light that time of the year is like the gold they still chase around in the rough hinterlands of Nevada. 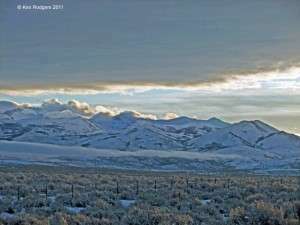 It comes in low, and streams parallel to the surface of the earth, its shine tinted a bit crimson, a bit silver, a bit bronze as it caroms off the juniper trees, sage and mountains like x-rays from outer space. We stopped where the road from Spring Creek to Jiggs intersects the south fork of the Humboldt River and watched water ouzels bicker over prey beneath the flashing surface of the river. They called and crashed, then dove below the water, then emerged to dance along the surface, as an immature bald eagle floated overhead. The willows and the water, the rugged trunks of the cottonwood trees, all caught the last brash bang of sunlight just before Old Sol’s setting. 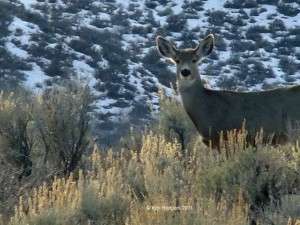 There are a lot of deer out along the east side of the Ruby Mountains. 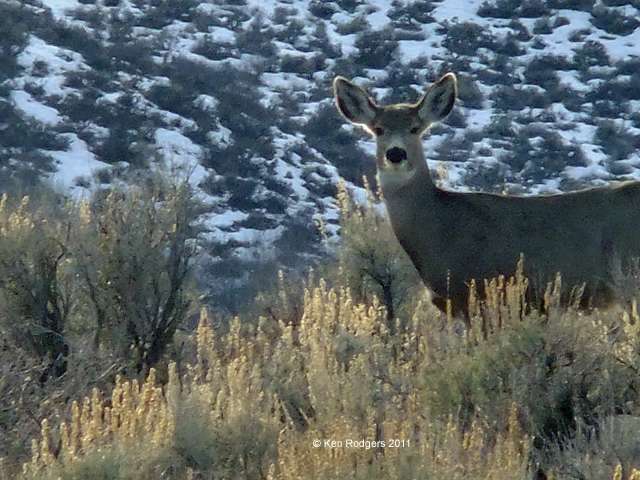 Big mule deer that browse alongside the roads in great gangs that warily watch approaching Hondas, then leisurely leap barbed wire right-of-way fences, then stop and curiously spy as we drive by. The bucks still had their horns and were running with the females which indicated to me they were still in the rut. At the hint of last light we got the Ruby Mountains on camera, and we now know exactly why they are named that. They were ruby. Then we climbed back in the Honda and drove back to the G Three Bar for a sarsaparilla and a visit with our cowboy poetry friends. This is a new form for me, and I thoroughly enjoyed your piece. It’s great that Ken has exposed you to his audience. Do you have your own site? Do you write this form, Ken? Rod and I are looking forward to accompanying you on some of these adventures next year. I can’t wait to introduce him to the Gathering and the Hinterlands! Here here to the Hinterlands.